Our last day started at the top of the Mount of Olives…where Jesus spent a good bit of time and, in fact, wept over the city of Jerusalem. It was also where Jesus and his disciples went after the last supper. The mountain got it’s name from the many olive groves–including the Garden of Gethsemane (at least, as we know it). The mountain was used as a burial site and has about 150,000 graves…including (by tradition) the graves of some of the prophets. From there we walked to the Garden of Gethsemane. There were quite a few people there which didn’t give much opportunity to appreciate what it would have been like the last night before the cross as the Lord prayed in agony. I wished the trees could talk–some of the trees still thriving there may date back to the time of Christ. Jesus was arrested and taken down into the city–a steep walk even now. There are lots more sites and cathedrals along the way, but we were more excited about sticking to the actual story than taking in the tradition, relics, and various churches–all wanting their piece of the holy land–along the way. The first trial would have taken place either at/near the temple or the house of Caiaphas–somewhere with a courtyard. Jesus had broken the Sabbath in their minds on many occasions, but that was not a capital offense, so the Pharisees needed something else. Thus, Jesus was charged with the capital crime of destroying the temple. But when they could not find the required two witnesses to corroborate any of the accusations, they got him on another charge–blasphemy. He claimed to be the Son of God by His own admission. Actually being there–even in a rebuilt city–gave us some appreciation for the various places Christ would have been taken that night. The determined religious leaders covered quite a bit of ground, taking him from the Mount of Olives to Caiphus, to Pilate, to Herod, to Pilate, then the place of the execution. Most of the way is now in the Muslim quarter of Old Jerusalem although the alleged “Via Dolorosa” winds through a good part of the city…mostly 30 feet or so above where Jesus would have actually carried the cross. The temple itself, of course, is now a Muslim holy site. One of the nearby shopkeepers, however, in exchange for our willingness to browse in this shop, gave us access to the rooftop of a Muslim school with incredible views into the Temple Mount. The people who had seen Jesus in Bethesda–just steps away from there–heal a paralytic, and so many other signs and wonders now yelled, “Crucify him,” “We want Barabbas!” and even, “We have no king by Ceaser!” Even Pilate could tell that He had been delivered up because of envy, but he feared a riot…so he let the people have their way. At some point, Jesus was taken to the governor’s headquarters, stripped and scourged. And from there, he was taken to Golgotha–or the place of a skull. There are two prevailing views on where Golgotha or Calvary is and the fact is, no one knows for sure. But we went to the place called the “Garden Tomb” which helped us catch a glimpse of what that last night might have been like. You can’t see it well from this picture, but there is a definite skull like rock formation in this cliff…and it otherwise fits the biblical description of the crucifixion well, being just outside the city walls (at that time) and in a traffic thoroughfare where they held frequent executions. It may have actually been on the parking lot or the cliff above…again…we don’t know. But either would stand in stark contrast to the fanfare of the Church of the Holy Sepulcher–which is partially owned by six different spatting denominations. From there, the body may have been laid in the garden tomb, hewn out of the hillside nearby. Again, we don’t know, but at the end of the day, it doesn’t really matter. Why would we look for the living among the dead? His bones aren’t there…or anywhere. The past, present, and future of Jerusalem is a story unrivaled by any other place. As we walked the streets, the words of the song, The Holy City rang in my head. One day, Jesus will return in like manner as He left. May He find us celebrating the fact that He came, lived, died, and ultimately won victory won over sin and death. Lift up your gates and sing! David founded Jerusalem, taking the hill from the Jebusites and moving the capital from the Judean area of Hebron into a more central area not previously identified with any tribe. He built a fantastic city which has remains (recently excavated) that we believe include his palace. They even found some clay seals which have some of the names of biblical authorities around David’s time. The clay–which would otherwise have disintegrated–was inadvertently “fired” by later conquerors of Jerusalem providing us some little bits of history thousands of years later. Pretty cool. In that time, for defensive reasons, people like to build cities on top of hills. But most water sources were in the valleys. Which is why you would have daughters. Preferably, a bunch of them. But even if you had girls to carry your water, there was another problem–a city without an internal water supply was not defensible at all. So, as we have seen at other places, the people came up with some truly ingenious ways of working through that issue. In this case, it included building a fortress around the water. It is not completely preserved, but parts of it have been excavated and they are incredible–especially considering the types of tools that would have been available to them at that time. Basically, bronze. Jumping forward, years later, King Hezekiah would come up with yet another solution. He changed the city wall and dug an amazing tunnel through the mountain–600 yards to divert that water and bring it inside. The Bible recounts this story and the fact that they started on the two ends and managed to meet in the middle. It is almost unbelievable, but our eyes saw it and half of us had the fun of walking up the tunnel back into the city, ending near the pool of Siloam. The water is still cold–running as high as our thighs in some places. Tell you what, things they built back they were built to last. No wonder Hezekiah liked to show off. Interestingly, the Syrians did come to attack Hezekiah, God struck them with blindness and they did not prevail at that time. Some of the history is hard to picture even standing there on the spot because the cities have been built, destroyed, and rebuilt so many times over the thousands of years. Walls have been moved; buildings have changed purposes, etc. Until fairly recently, there was not a lot of effort to excavate or preserve much of anything in the City of David…the old, old Jerusalem. In fact, most of it is just an Arab neighborhood. Of course, we know that the first temple site was also in the City of David (annexed to it, actually), not built by David, but by his son, Solomon. That temple was destroyed and later reconstructed by Ezra. The next really impressive temple was actually built by Herod, not long before the days of Christ. It was really more of a political move for Herod and it served to both appease the Jews and provide for a center of commerce. At Jesus’ time, there was a new Jerusalem (now, the “Old City”) on the mountain above the City of David, and on it, Herod enclosed a huge site into a large table (now, the “Temple Mount”). The stones used to build this site are incredible. We saw one 6000 tons: is was 32 feet long and 15 feet deep. Curtis used the level app on its phone and we could see that 2000 years later, it was still perfectly level. The stones aren’t cemented together in any way—they don’t have to be I guess. Even now with our modern tools, a 6000 ton stone isn’t going much of anywhere. As Jesus prophesied, the temple which stood there during his day was completely torn down and hundreds of years later, the Dome of the Rock was built there and the Muslims claim it now as a holy site. The temple mount remains, however, as an incredible tribute to Herod’s construction prowess. And, of course, it is still the site of much biblical history from Jesus as a young boy to his throwing out money changers just days before his death. The massive size of it also gives perspective on how many pilgrims would have traveled to Jerusalem to celebrate the Passover in those days. Thousands from all over would have heard and known of Jesus and taken the stories back to their cities and villages. And I’ve seen Jesus in Israel—from the City of David (his great great-great-great grandfather) to the stories we heard of recent Jewish history while watching Jewish boys playing in the streets of the Jewish quarter. The story is one of law and grace. Law which came through Moses and grace which came through Jesus Christ. The Jewish people have a history that ties together the Old and New Testaments. The fact that they are still around at all after the wars, desolations, holocausts, dispersions, and drama that checkers their past screams of a God who chose them to be His people and who sent his Son as a Savior. One of the things we learned in Capernaum gave us a taste of how the 613 Levitical laws have turned into the myriads of Jewish rules and regulations. If you are familiar with the law of Moses, you know that God said not to boil a kid in its mothers milk. That is just one example. Imagine doing that for all 613 laws. Could get a tad cumbersome after a while. At the same time, He did not seem to appreciate the efforts of the Pharisees to enforce the rules as they extrapolated them. He was not impressed with their efforts to tithe down to a tenth of their spices. He healed on the Sabbath. He broke rules and tradition by reaching out to foreigners and women. It seems the difference between Jesus and the Pharisees is that they were concerned about the external while He was concerned about the internal. Jesus reduced the law down to two commandments: love God; love others. Then He became the perfect fulfillment of that law. We left for Jerusalem and Gilad taught us a lot as we drove through the annexed territory known as the West Bank. We pulled in just about sunset and it was amazing to see the city spread over the mountain in the dimming light. Since it was the beginning of the Israeli Independence Day, he warned us that Jerusalem would be a bit of a zoo. And he was right. At least, the Jewish side. It’s really remarkable how Jerusalem (new city) is divided into two by two very different people groups living side by side. We checked in to our hotel and then tried to walk around a bit. It was already 8:30 pm though and the streets were filling with all ages getting ready to party hardy. They had stages set up for bands and music and all manner of booths selling everything from cotton candy to blow up torture devises. I’m not joking. We decided to have a late dinner and upon putting in our table request, were a bit puzzled by the question they asked us…meat or dairy? Yep, they have two completely different sides of the restaurant with two completely different menus. We opted for meat side considering the fact that we’ve had mostly vegetables since we’ve been here. We ended the meal with dairy-free ice cream and chocolate mousse and watched out the window as the party continued to gain momentum. People wore the Star of David on their hats, headbands, faces, and it was printed on their blow up pitch forks and spiked mallets. I’m still not joking. And there was nothing joking about the soldiers we saw walking around, (some dressed in civilian clothes) carrying M-4s. None of them looked over 21. It was a wild scene in certain respects, but it was clearly an accepted part of the culture here. Anything goes…As long as you don’t mix your meat and dairy. Thankfully, they warned us about the fireworks that would be going off in the middle of the night. Otherwise, we might have thought it was…something else. Still a little bazaar to think that they shoot off fireworks in the middle of a crowded city. I mean, for a bunch of people that won’t eat meat and dairy in the same sitting. I mean that respectfully, of course. When we woke up this morning, the streets had been cleared and cleaned. It was as if nothing ever happened. Any city that can pull that off deserves respect. We stayed in little cottages on the Sea of Galilee. It was after dusk when we arrived so it was hard to get a good picture. Gilad was apologetic for the darkness as well as the brownness of this time of year, but it was still beautiful. If you look across the sea, you can see into Syria and Lebanon. Everyone else went to dinner but I went to bed. It was not a successful attempt at sleep, however. Tired as I was, my body seemed to know it was 2:30 pm, not 9:30 pm and I could not sleep. It didn’t help that my phone kept buzzing, beeping, and ringing. I was afraid to turn it off because it was my only alarm. I’m not so sure the international cell phone plan is such a good thing after all. This day was spent around Galilee–basically, in the area where Jesus spent most of his ministry. In His time–just like today–one side on the sea was non-Jewish. So when Jesus went to the other side to get away, he was really going out of the country and into gentile territory. And, in His infinite wisdom, He didn’t have an international cell phone plan. Jesus would have stood on that bank when He called His disciples out of their careers as fisherman into a new calling as fishers of men. A few years later, He would have fixed breakfast somewhere on those rocks just before returning to heaven. We read some of the other stories of the Sea of Galilee from Mark, including Jesus calming the sea and his casting many devils out of the man who lived among the tombs. From there, we saw the remains of the poor town of Capernaum as well as the Mount Beatitude and the place believed to be where Jesus fed the five thousand with five loaves and two fish. To this day, it is a desolate place with no place to buy food. But you can get cell service. The mix of Jewish, Christian, and Catholic influences have made for interesting touring. Many of the sites are now owned and run by the Catholic Church. At first I found it a little irritating to see the Bible stories turned into basilicas and relics, but the reality is that the sites would probably never have been preserved if they hadn’t. The average Jew neither knows nor cares anything about New Testament history. Of course, the same is true for the Arabs. As Gilad read the story of various miracles which took place at each site, He gave us a “Jewish” interpretation. Which was basically that they were not miracles at all–just allegories. I guess when you don’t want to believe Jesus is the Son of God, that is what you do–change literal into allegorical. But, as Curtis pointed out, one thing He could not explain was why the people in the stories would marvel. Lives were changed when Jesus touched them. People were not just healed physically, but willing to follow the Lord anywhere. Magdala was our next stop. I was less familiar with this place (although we all know at least one of its citizens–Mary Magdalene), but the ruins were interesting and the history was fascinating. Basically, the entire fishing village was martyred for its Jewish faith by the Romans around 67 AD. What was most interesting about this town, however, was that while most of the ruins we have seen–including temples, synagogues, and churches (though old and historical)–were built hundreds of years after the time of Christ, Magdala has remains of one which was existing at the actual time of Christ. In other words, given the close proximity to Capernaum, this was ground Jesus probably actually walked in and stones he actually sat on…not 30 feet above them and not built in His honor 300 or 1300 years later. He was actually here. The synagogue was the remains of a fairly small stone structure with one podium and two rows of seating along the walls where Jesus would have read from the Torah. I could almost hear his voice ringing in the hall, Today, this Scripture had been fulfilled in your hearing. You can choose not to believe it and you can argue a lot of things, but this man and his fisherman followers definitely turned this world upside down. People are not traveling here from all over the world and all walks of life because of allegories and parables. We stopped for lunch at a little Arab cafe and ate an interesting assortment of salads, bread, and sauces. The waiter spared us no smiles, slapped the food on the table, and didn’t mind touching it in the process. I tried not to think about that part. I was hungry. Even without a scrap of meat on the table, the tab came to $10 a person. This country is not cheap. We headed up Mt Tabor–otherwise known as the Mount of Transfiguration. We stopped along the way to look down over the plains including the place where Deborah and Barak conquered Cicera and where Gideon and his army of 300 beat the Mideonites. We were also overlooking the plain where Elisha brought the Shunamite woman’s son back to life. Our last stop of the day was at the Jordan River. Because it was the end of the day and the start of a holiday, we weren’t able to see the associated church or go down to the traditional baptismal site. But Gilad said he could get us down to the Jordan another way. And he did. Turned out to be one of the strangest experiences ever. I thought someone was joking when they said they saw American Indians. But the next thing I knew, we were driving up to an arch decorated with a canoe and an American Indian mannequin. There was a strip of land with water access decorated with totem poles, canoes, feathers, carnival games…the whole deal. Apparently, in the normal course of things, you can rent a canoe and paddle the Jordan. Business must have been winding up for the day and there were just a few scattered Indian looking people, some girls sun bathing in next to nothing, and a little child running around in less than next to nothing. So…as I mentioned…it was weird. Kinda hard to put my mind in the context of the baptism of Christ given the Totem poles and all. And sort of an anti climactic end to the day. So…we watched the guys skip rocks and then left and got ice cream. That helped a lot. Seriously, I hadn’t had chocolate since yesterday morning. That’s a lot of life lived between chocolate. With that need met, we loaded up and headed for Jerusalem. But I’ll save that story for another day except to tell you along the way we passed another site Gilad said is actually more likely the true baptismal site. I think I’m going with that story. No totem poles. No cell service. PS – Anita wanted some olive oil and we stopped at a fascinating tea and spice kind of shop. Probably fifty different kinds of spices in open baskets competing for air. Many shekels were spent on that diversion. PPS – Donna…this place would have killed you. And all the Mileskis. Period. 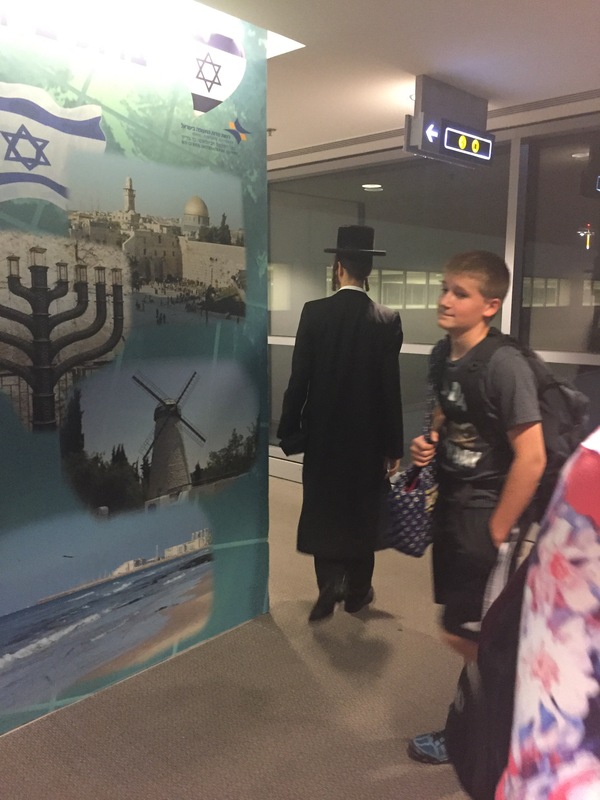 I would say the experience truly started on the flight from Paris to Tel Aviv. It was a full flight. Full of Jews–most of them young men in dark dress pants, a white dress shirt with a prayer shawl underneath, and a dark head covering in one of two styles. About a third had a long curl of side burns. I was seated next to one of the more “liberal” young men; black, white, and prayer shawl: check. But instead of the typical head coverings, he wore an Under Armor baseball cap. He was pleasant, which was convenient, because I suddenly found myself with so many questions. I’ve been quite a few places, but these people and their culture intrigued me perhaps like no other. A few years ago, no matter how many questions I had, I wouldn’t have asked. But I’m older and much less inhibited, I guess. I’ll ask if I want to. I asked why some had the curly sideburns and others don’t. He sort of explained…complicated. That’s the answer. Then another lady came down the aisle. Are you in the window? I asked, pointing at the only empty seat left in our row. “Yes,” she replied. “But I would prefer to sit here.” She pointed to my aisle seat. Well then. So now I was in the window. But my victim was still stuck next to me. This young man was from a Jewish community in Long Island. 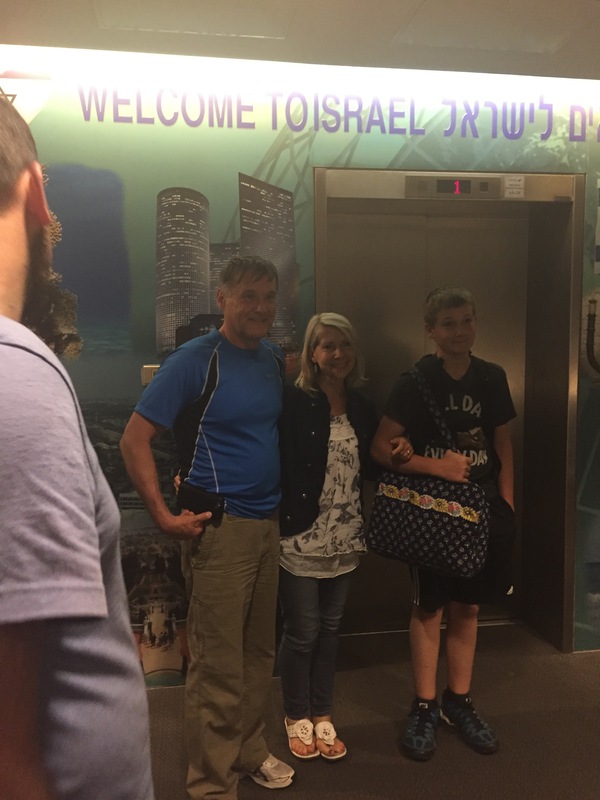 He was returning to Israel to finish the last of three years of schooling in Israel. Apparently, in their final semester, the boys do a combination of one-on-one discipleship and group partying. Sitting in the boys’ section gave me a little taste of what they probably mean by partying…they were asking the flight attendant for Whiskey and watching crazy stuff on their iPads. Probably not much different than a bunch of guys from Long Island not Jewish. I asked him questions about the economy, the safety, the lifestyle… and the recurring answer was that Israel is a complicated country. At least that one wasn’t complicated. He hoped to get married soon so I asked if he had a girlfriend. I got the impression that the girlfriend thing hadn’t worked out so well for him, but the fall back was matchmaking. Apparently, a process now largely handled by moms. Sounds complicated. Okay, so I did refrain from asking how they keep their little caps on. Some had little clips, but others mystify me. But I had to let him nod off after a while. While he slept, I tried to think of a creative way to bridge our conversation into the gospel. But when I tried, he was clearly not interested. That much was simple. If the airplane food was in any way an indication of what food they serve in this country, I am going to lose weight on this trip. The only thing on the tray I would label as “good” was a piece or dark chocolate the size of my thumb. But then, never judge a country by airplane food. Even my captive seat mate didn’t eat it. It was about midnight when we landed. I said goodbye to my new friend and we took our weary bodies to the hotel looking forward to exploring this complicated country for ourselves.